Growing up on a remote farm in the Yorkshire Dales, I developed a love for the outdoors and adventures. School was not for me; I was bullied due to being dyslexic and for suffering from extreme shyness. I struggled finding work after finishing my education but an Accidental Yes changed my life and led me unexpectedly down an adventure-filled road. When it came to leaving College, I was nervous about starting life in the working world. I had just finished a course in Animal Management, so I was looking for work involving animals and the outdoors. Pets at home, vets surgeries, zoos and bird of prey centres were my target. I had been working part time in a bird of prey centre already so I was hoping to go full time there. Suffering from shyness and anxiety meant I struggled with interviews. Often I would stop just before walking through the door and talk myself into turning around and going home. A few jobs I had applied for held telephone interviews, which I preferred as I didn’t feel all the pressure in that set-up, in comparison with sitting in a room with other people going for the same role. Then one afternoon I received an email, offering me a role at the bird of prey centre. It provided accommodation and food, which I thought was amazing. It gave me the chance to move out and grow as a person. Within a few minutes of scanning this email I replied – I said YES to accepting the role! Turns out the role I had accepted was not in the UK – I had accidentally accepted a job in South Africa! I had never been abroad – but at 18 years old I knew I had to go for it, so I found myself flying off to a completely new continent! At first I panicked but I thought: go for it! I worked with birds of prey from eagles to owls. 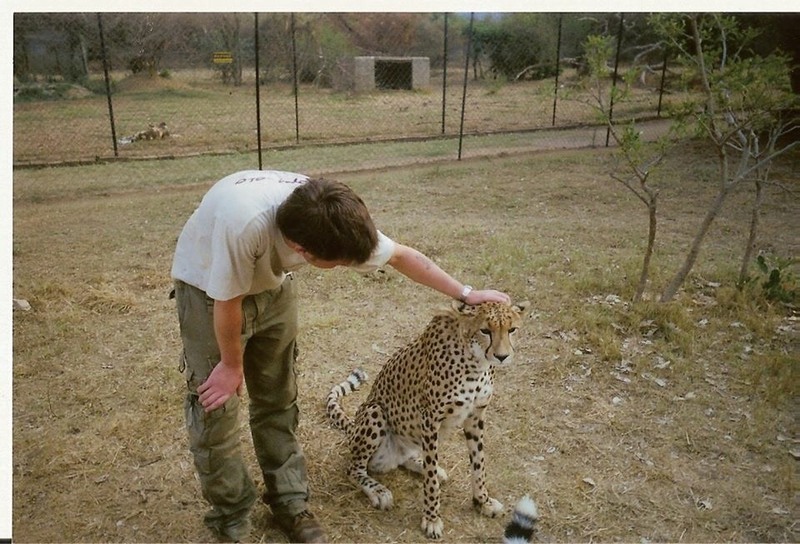 I also helped with the Big Cats, which lead to me getting attacked by a cheetah. A cheetah’s claws are like running spikes and are not retracted like other cats; so as I stood up with the cat on my back, its claws ran down my back leaving me with a nice scar. I also helped to raise orphaned animals, like cheetahs, lions, rhino and a hippo called Humphrey; now when a 30st baby wants to play you know about it. It was like taking on Anthony Joshua. Humphrey later killed a man, but if you try to ride a fully grown Bull Hippo, it’s never going to end well. I loved my time in Africa and I learnt so much. When I returned home I did many random jobs, from making chocolate to working as a porter in a auction house. I even became an actor in a film version of Wuthering Heights (I don’t recommend watching it) and also appeared in a Mars Bar advert with Peter Crouch. I started to become depressed as I knew I wasn’t happy - so I went from job to job. But I remembered my time in South Africa which instantly brought a grin to my face. So I left my job, packed a bag and went to Asia. I rented a Scooter and rode it around Vietnam, through mountains, jungles, deserts and swamps, and back up a road with so many unexploded bombs that it would take 300 years to remove them all. I found my happiness by saying Yes to something I had never dreamed of, and this has now led me to becoming an Expedition Leader. I now share my passion for the world and its wildlife to groups of people. All because I accidentally said Yes! Our Yes Story is pretty small compared to some of the amazing ones featured on Tribe Stories– but that’s partly why we love it! Despite my colleague Rory and I having relatively exciting careers working for a humanitarian charity and travelling quite regularly, we have bonded over our feeling that our day to day working lives are not quite enough for us and that we need more adventure, excitement and challenges in order to be satisfied with what we’ve achieved in our short life on this crazy planet. We’d been playing with ideas over the past year about what we could do – drive a tuk-tuk from Nairobi to Cape Town, cycle across Asia, rollerblade across Europe – but, whilst our dreams are definitely big, reality has unfortunately got in the way. We’re broke to start with! We also not only need our jobs but LIKE our jobs. And I am the mother of a crazy two year old so it is not realistic to simply disappear for weeks at a time in pursuit of adventure – as much as I would like to! But, despite the challenges, we’ve kept the faith and kept talking, often over too many glasses of wine, about the adventures we could and should be having. This desire to live life differently and break out of our comfort zone led us to Dave Cornthwaite and the Yes Tribe – and the ideas that had been zooming around our heads started to seem less and less crazy. So, that evening, still in the pub and still drinking wine, we wondered “what shall we say Yes to?” We decided it had to be something soon – something we couldn’t overthink, something we could afford but something that felt like a proper adventure that we could be proud of. 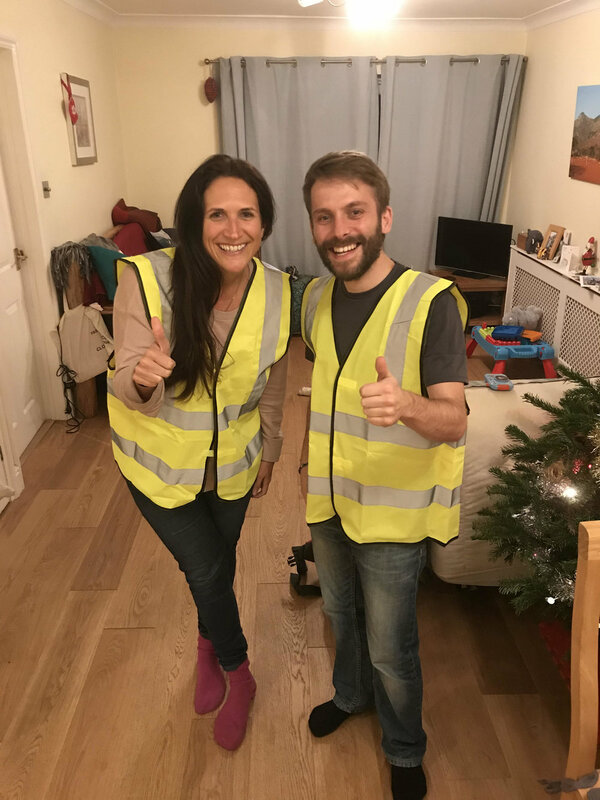 And we somehow came up with the random idea of walking overnight from home near St Albans to our South London office in time for our work Christmas party. When I woke up the next morning to a text from Rory saying “we had better start planning the walk”, I of course had no idea what he was talking about for a few minutes but, after a shower and a coffee, planning commenced! And by ‘planning’, we found two Ordnance Survey maps and looked at them in the office for 10 minutes; we bought a head torch and we checked our walking boots still fitted. But we were still quietly confident – even when four inches of snow fell two days before we were due to set off and we started getting texts from alarmed friends and family saying “nobody would think less of you if you didn’t do this you know”. But this just spurred us on even more. Plus, we were fundraising for Concern Worldwide (our employer) and turning up in an Uber to see all the people who had sponsored us for the walk just wouldn’t cut it! Luckily for us, despite the icy conditions, the night of the walk was mild, the sky was clear and, as we set off at 1.30am, dozens of falling stars twinkled overhead – a rare meteor shower that we were so lucky to walk beneath as we set out on our adventure! By 3.30am, we’d hit St Albans and, by 5.30am, Radlett. We followed the line of the numerous train stations that I pass through on my daily commute without a second thought, usually with a nose in the armpit of another commuter, smartphone in hand, scrolling through social media and dreaming of more. We thoroughly enjoyed these first few miles. Walking in the dark and passing through deserted towns and villages and imagining everyone fast asleep in their beds whilst we were on our journey really added a twinge of excitement that we hadn’t expected – and this feeling that “we’re living life a bit differently to most people right now” is what we had been searching for, and can already feel ourselves becoming addicted to. Crossing the M25 at 4.50am was weirdly one of the highlights – the most hellish ring road known to man and the barrier between London and ‘everywhere else’. My horrendous sense of direction meant I had never really known where the M25 is in relation to where I live so reaching it stimulated some excitement! Even at this time of the morning, it was absolutely packed with lorries and early commuters and was a truly depressing view of our modern world. Yet walking over the top if it, head torches blinking and flickering and maps in hand, was a real milestone. From here, we suspected it would get easier – we’ve crossed the M25 so we’re in London right?! The commuters were starting to appear and the first hints of dawn appeared on the horizon. But this was actually the hardest section by far – walking through Elstree and Borehamwood and on to Edgware was rather monotonous. Straight road, fast cars, narrow pavement, and an increase in the number of fast food shops, garages and industrial estates. We’d left the countryside yet still had a long way to go to reach London, and the ‘adventure’ side of things was definitely waning. But, then we hit Kilburn at around 11am, my old stomping ground, and our spirits lifted immediately – ZONE TWO of the underground! This was actual London! We were going to manage it despite aching muscles, Rory’s sore knee and the hole in my toe! So, we stopped for a pint! This was a glorious idea and a terrible one at the same time because, even with alcohol soothing our aches and pains, re-starting the walk after an hour of rest was very difficult, and this was probably the closest we got to actually calling an Uber - but we heroically resisted! After this, things got better – through Maida Vale, Royal Oak and on to Hyde Park and ‘proper’ London. With our Concern Worldwide tabards, maps around our necks and disheveled appearance, we received some baffled looks from the Kensington crowd but by now we had our eyes on the prize. The glorious feeling of seeing the Thames and belting out Heather Small’s ‘What have you done today to make you feel proud?’ was briefly overshadowed by the lack of shop to buy Prosecco. But Google Maps came to our rescue (Benedict Allen, take note, so handy) and we finished the final mile with bubbles in hand and a spring in our step, to be greeted by the cheers of our colleagues and a very enjoyable Christmas party, even if we did have to bail early due to exhaustion. It was a small challenge compared to what some people achieve but one that we wanted to do in order to prove to ourselves that we could devise, plan and execute our own adventure – even with minimal preparation and in the middle of winter – and now we’ve been spurred on to more . We have some exciting plans up our sleeve. Watch this space! A weekly (most of the time!) round up of stories, events and projects coming out of the YesTribe. Researched and written by Richard Potter. The Exumas are an archipelago of 365 cays and islands which begin 35 miles southeast of Nassau, in the Bahamas. Coastlines are beautiful and life is very peaceful, or at least it was before Tom and Julia arrived! They started their SUP journey in Georgetown and paddled south down the eastern side of the island before turning right and heading north up the western side to Baratarre key. From there they plan to explore the islands further out in the archipelago. They've already seen stunning beaches with crystal clear water, so we can't wait to hear about the rest of their adventure! You can follow them on Facebook using the links above. Happy paddling Tom and Julia! Are you free the weekend of 1-2 April and keen for a cycle? So are Alexandra Spencer, Emily Burns and Lucy Lucilea Amos! At dawn on Saturday the 1st they'll be setting off from Big Ben and cycling to Dover (they'll be Geocaching along the way and camping out on Saturday night) before getting the train back to London from Dover on Sunday. Everyone is invited so RSVP to the Facebook Event if you're keen to join the fun! Someone in the YesTribe Facebook Group might even lend you some cycling kit if you're needing any bits and pieces. Have you been inspired by any of these stories? Do you have your own to share? We'd love to hear about it. The YesTribe is a community that is free to anyone who is looking to make life less restricted, more enjoyable, more interesting and more memorable. Your story doesn't need to be an endurance adventure: many of the YesTribe are making films, raising money for good causes and developing the community. We'd love to hear from you: share your stories here at Say Yes More or join the YesTribe Facebook group to connect with fellow YesTribers. Make life memorable, Say Yes More! On the 4th of May 2015 Tim MIllkin hopped on his bike in Reading, Berkshire and began a fantastic cycling journey around the World to Reading, Pennsylvania. Since then he's travelled 25,000 kilometres and have been on his bike for 628 days! Tim is shortly due to start the second half of the trip which will take him from Ushuaia, Argentina to the finish. He's got 15 more countries to visit and another 25,000 kilometres to cover before he finishes in summer 2018. Go Tim! You can find out more about Tim's trip on this website and you can also follow him on Facebook. Dare2express is a charity that helps people with mental health conditions obtain grants for the cost of treatment. On Monday 13 March John Dennis, the founder of dare2express, will give a talk aimed to inspire people and offer courage through daily struggles from a child of suicide, a suicide survivor, severe depression and PTSD. John will also discuss tools he has used to fuel his love of life and of adventure again. For more details about the talk and to register for a free ticket, visit this website. You can also visit the website and Facebook page for dare2express. A weekly (most of the time) round up of stories, events and projects coming out of the YesTribe. Do you care about animal welfare? Stephen Brassett certainly does! On the 7th of January he began walking over 4,500km around New Zealand to raise money for animal welfare organisations, raise awareness about the issues these organisations face and generally improve animal welfare in New Zealand. Stephen started in Invercargill and his route will take him up the South Island, to the top of the North Island and then back down to Wellington for the finish. He's reached Gore already even though the floor of the micro camper he's pulling behind him was torn out during a transit accident. We're wishing him well and looking forward to further updates about his journey! You can follow the progress on Facebook or on this website and you can make a donation at this site. On the 27th of January YesTribers will be attending The Wassail, a ceremony that ensures lasting health of the orchard. Its a merry night of noise, fire, food, drink, poetry and songs! If you'd like to join them just head to Hasslemere train station by 5:30pm on the 27th. Full details are available on the Facebook event page. We’d love to hear from you, share your stories here at Say Yes More or join the Yes Tribe Facebook group to connect with fellow YesTribers. A weekly (most of the time) round-up of stories, events and projects coming out of the YesTribe. In November 2015 Michelle Ellison, Tom Hook and Andy Grant began a challenge to climb the highest peak in every country in Europe. The list (available here) ranges from Mount Elbrus in Russia (5462 metres) to St Peter’s Dome in Vatican City (132 metres). They’ve scaled 18 so far and have 30 to go. Next on the list is Monte Titano in San Marino, which they’ll be tacking later this month. When they complete their challenge (the finish is scheduled for October 2017) they’ll have climbed an epic 87,704 metres with the support of The Outward Bound Trust. If you’d like to make a donation to the Trust please visit this site. For more information about 48 peaks later and to follow the team’s progress, check out their website. They’d like as many people as possible to join them on the climbs so feel free to get in touch with them if you’re interested! In particular, they’re looking to have 45 people join them for the final climb, Snowdon, so that 48 people will climb the 48th peak. To start off 2017 with a bang, Tara Papworth made the 1st of January the start of a 1200km cycling trip down the Carretera Austral in Chile. The airline lost her baggage but this hasn’t stopped her adventure: we look forward to seeing further updates on her Facebook page. Go Tara! If you're based near Bristol (or will be in the area on the 8th of January) and you fancy meeting some fellow YesTribers, then come along for a 6 mile walk (taking in Blaise Castle and Kings Weston) followed by roast dinner in a local pub. The meeting point will be in Shirehampton at 11AM on the 8th: full details are yet to be confirmed but will be listed on the Facebook event page. Have you been inspired by any of these stories? Do you have your own to share? We’d love to hear about it. The YesTribe is a community that is free to anyone who is looking to make life less restricted, more enjoyable, more interesting and more memorable. Your story doesn’t need to be an endurance adventure, many of the YesTribe are making films, raising money for good causes and developing the community. A Weekly (most of the time!) round-up of stories, events and projects coming out of the YesTribe. After losing her friend Rob Worboys to an undiagnosed heart condition, Lucy Baker has embarked on a series of 500 mile challenges to raise money for Cardiac Risk in the Young. She's completed a 500 mile commute on a single speed bike and is now onto a 500 mile triathlon, after which she'll retrace a 500 mile route which Rob followed during his life (Bedford to Leeds to Sheffield to Edinburgh). You can find out more about Lucy's adventures on her fundraising page. In just under a week, Tim Platton will start a 1000 mile run to raise money for Asthma UK. Tim was diagnosed with asthma as a young boy and, while he's been able to manage his condition, his ability to engage in physical exercise was limited. He's selling the miles for £2 each: to grab one, visit his fundraising page. Buying miles will help Asthma UK work to stop asthma attacks, support people with asthma and, ultimately, find a cure. To end 2016 on a high note, Adam Conlon is on a 315 km run from Bath to Belfast. He set off on the 15th of December to raise money for Walking with the Wounded's Walking Home for Xmas Campaign. Go Adam! You can follow his progress on Facebook and you can also visit his fundraising page. Little Paddle was created by Andy McLean and Nick Miller following on from the Quapaw 24 Big Paddle in April 2016. Little's Paddle's 8th outing, held over the weekend of 10 and 11 December, was their Christmas special and first venture outside of England. The team met up in Monmouth and paddled the River Wye. Over the year Little Paddle has gone to the Cotswolds, Kent, Shepperton (home of the Yes Bus), Bath, Windsor, Bedford, The Peak District and finally to Wales. A typical outing consists of paddling on Saturday, a camp out and more paddling on Sunday. However, of late (with the weather getting colder) the team has taken to indoor accommodation including Mount Cook Adventure Centre and has also embraced walking. They've even tried to break the Guinness Record for "Most People in a Telephone Box". The next Little Paddle outing will be in January in Essex. Please contact Paul Balson if you'd like to come along. Everyone is welcome: Ollie Hull, who is only 7, has come on four Little Paddle outings already. Do you fancy hiking up a mountain in Scotland? Since the 1st of November Will Copestake has been on a mission to climb 222 Corbetts in a single winter season and he’d like YOU to join him for a summit or two. You can find more information, including his contact details, on this website or by searching for #coldestcorbett on Twitter, Instagram or Facebook. From November 2015 to November 2016 Anne-laure Carruth made a visual diary of her mind by painting one picture every day. The project, A Peek Inside, is a wonderful kaleidoscope capturing all the promise which the world can offer and the fragility that comes with trying to bring our dreams to life. You can find out more about A Peek Inside here. Chris Andrews is taking walking and talking to a whole new level. On the 8th of August he began a 3,000 mile journey on foot across the U.S.A. to celebrate face-to-face conversation in a digital age and encourage shifts in the way we think about communication. Chris is currently 127 days into his journey: if you’d like to follow his progress, or maybe even catch up with him for a face-to-face chat, please visit his website or his Facebook page. Nikki Gilbey is joining the S/V Seadragon as it travels around Scotland during leg 2 of eXXpedition Great Britain, to conduct research and raise awareness about the impact of plastics on people and on the sea. In particular, eXXpedition Great Britain will explore how plastics, chemicals, endocrine disruptors and carcinogens in our personal and global environment can cause disease. The expedition also aims to engage women in scientific narratives relating to the consumer choices they make and their long-term health impacts on themselves and our environment. S/V Seadragon’s all-female crew will be stopping off along the way to work with local communities and tourists to raise awareness, share findings and educate. Nikki would be very grateful for any help you could give: her fundraising page is here. November 30 saw the launch of the Snow Camp Collective, a passionate tribe that supports the work that Snow Camp is doing to support inner-city young people. Snow Camp uses snowboarding and life skills programmes to help them grow in confidence and self esteem, develop as individuals, reflect on key issues, develop new skills and make positive choices during their lives. You can find out more about the Snow Camp Collective here.